The National U.S.-Arab Chamber of Commerce (NUSACC) today hosted, in cooperation with the Meridian International Center, a high-level delegation of Yemeni public and private sector leaders visiting the United States as a part of the International Visitor Leadership Program (IVLP), the State Department's professional exchange program for current and emerging foreign leaders. During the meeting, NUSACC and the delegates discussed potential cooperation opportunities, including capacity-building programs, job creation initiatives, trade shows, and import-export promotion. 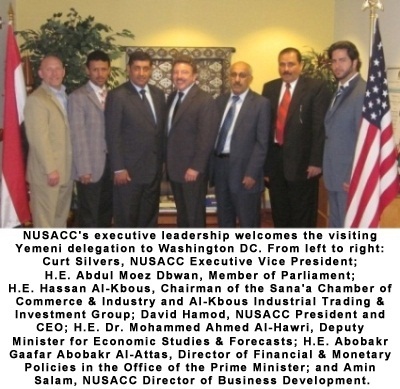 Highlights of the discussion included organizing a visit to the United States for a multi-sector Yemeni delegation, increasing Yemeni participation in NUSACC's annual High Tech Road Show, and, most important, strengthening relationships between the National U.S.-Arab Chamber of Commerce and chambers of commerce throughout Yemen. 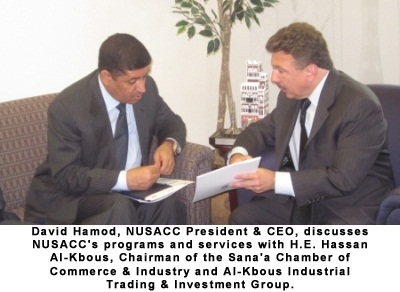 "The Republic of Yemen is on the road to recovery, and there is increasing recognition in that nation that economic growth needs to be driven by the private sector," said David Hamod, President & CEO of the National U.S.-Arab Chamber of Commerce. "Our chamber looks forward to working with our counterparts in Yemen's business community to promote entrepreneurship, foster growth among small & medium-sized enterprises (SMEs), and help lay groundwork for a more attractive business environment throughout Yemen." ​At a recent roundtable discussion co-hosted by NUSACC, the U.S. Ambassador to Yemen, Hon. Gerald Feierstein, highlighted recent efforts to work with the Government of Yemen to promote greater private sector engagement. "There's no doubt in our mind, at the end of the day, that the engine for economic growth and prosperity for Yemen, like everywhere in the world, is going to be the private sector," noted Feierstein. "We believe that the Yemeni private sector is well-positioned and eager to take on a bigger role in Yemen's economy." In 2011, U.S. exports to Yemen decreased by 0.3 percent from 2010 to $389.9 million. During that same period, however, U.S. imports from Yemen jumped by 209.7 percent from the previous year, to $561.7 million. Top states exporting to Yemen in 2011 included Oregon, Washington, New Jersey, New York, and Texas, and top import sectors from the United States included agricultural products, transportation equipment, and non-electrical machinery.